In this quiet part of Zakopane, you can find peace and rest from the tourist crowds and noise. 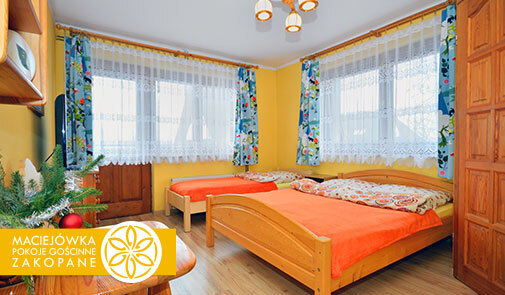 We offer four rooms for 2-4 people with bathrooms and a wonderful view of the Tatra mountains. Maciejowka Guesthouse's location will suit everyone everyone: hiking tourists, connoisseurs of local specialties and Krupowki lovers. This is the ideal place for a romantic trip or a family vacation. Our guests simply forget about stress of everyday life and absorb positive energy of the Tatra's nature. If you are a foodie and love to explore local specialties there is a couple of regional restaurants and traditional taverns with live music in close vicinity of our house. But if you prefer to prepare your favorite dishes by yourself, you can get all the ingredients from a grocery store nearby and use our kitchen. We run a small family business with four guest rooms only. No need to worry about large, noisy groups! Extraordinary Tatra nature and quiet surroundings will ensure your repose. Each of our rooms has its own bathroom and balcony. Pine beds with comfortable mattresses will ensure a restful sleep and repose. There is also an electric kettle and TV with over 20 channels in every room.